Her eyes, Neria noticed, was not quite as orange in the human form as they were when she was a bird. Closer to yellow. Her hair was as black as the raven’s feathers had been though, and her features handsome, almost masculine in their boldness, but beautiful all the same. She was a little taller than Neria, who herself was of above average height for an elf, and her small mouth was curled in an expression of contempt as she descended the steps. As for her dress – well, Neria could tell that it was not only magical ability that she and this shape-changing witch had in common. The dress was flimsy enough that Neria would have worn it with pride, consisting of a piece of cloth the colour of a dark, red, Antivan wine, casually falling over her breasts in such a manner as to cover as little as possible without being completely redundant and a cowl over the head. A necklace of raven-feathers and bear’s claws hung around a fair, long neck and were tied into armbands and in a belt around her waist, with a black skirt below that seemed to be made from leather. She continued to walk until she was at the bottom of the stairs, level with them. “You fear barbarians will swoop down upon you?” she asked, raising her arms in a mocking gesture. “Yes, swooping is bad,” said Alistair, matching her tone. It was amusing to hear the smooth-talking Denerim cut-purse revert to the accent of a village farm-boy faced with what must be, for him, mortal terror. The ‘Witch of the Wilds’ was what rural Ferelden women in this part of the country threatened their children with if they did not behave. The fear, no doubt, ran deep. This woman was certainly a witch, and lived in the Wilds, but as of now, Neria saw no reason to fear her more than any other mage. “I am Neria. A pleasure to meet you,” was Neria’s answer, accompanied by the most disarming smile she could summon. There was a moment there, the breeze blowing through the trees and dilapidated ruins, when Morrigan and Neria looked at each other, blue eyes and yellow, and the others seemed to grow somehow smaller, as though they would never share the understanding that two mages did, and could. “How very eloquent. How does one steal from dead men, I wonder?” she shot back. “Then who removed them?” asked Neria pacifically. “It was my mother, in fact,” she said, raising her eyebrows with a half-smile. They began to walk behind the mysterious witch, Neria and Alistair in front, the other two trailing behind, Daveth obviously in a state of fear. “She’ll put us in the pot, she will…,” Daveth was whispering to Jory behind her. “If the pot is warmer than this forest, it will be a nice change,” replied Jory. Which was the most intelligent thing he had said since she had first laid eyes upon him. Their walk was a long one – and also completely free of any encounters with darkspawn, wolves or any animal bigger than a rabbit. It made Neria not a little suspicious, but she kept her thoughts to herself. ‘Mother’ proved to be a grey-haired and wrinkled but otherwise hale and hearty woman in a faded green dress. There were faint indications of beauty behind those wrinkles, but one would have to have look very hard to find them. “Are we supposed to believe you were expecting us?” asked an incredulous Alistair. “I’m not quite sure what to believe,” she said. It was Morrigan’s turn now to roll her eyes. “They did not come here to listen to your wild tales, mother,” she said, still in the sing-song lilt. She began to walk towards the small hut in which it seemed she and Morrigan lived. They could hear her continue to talk as she was inside and when she came out, holding some scrolls of parchment in her hand, she admonished them not to bother about the broken seals, saying they had worn off a long time ago. “And how do you know that?” asked Neria. “Do not be ridiculous, girl, these are our guests,” her mother cut in. And with that, she began to march away. Neria looked from the daughter’s shapely figure to the mother’s still-cackling face, and stifling the questions she had in her mind, followed the daughter. 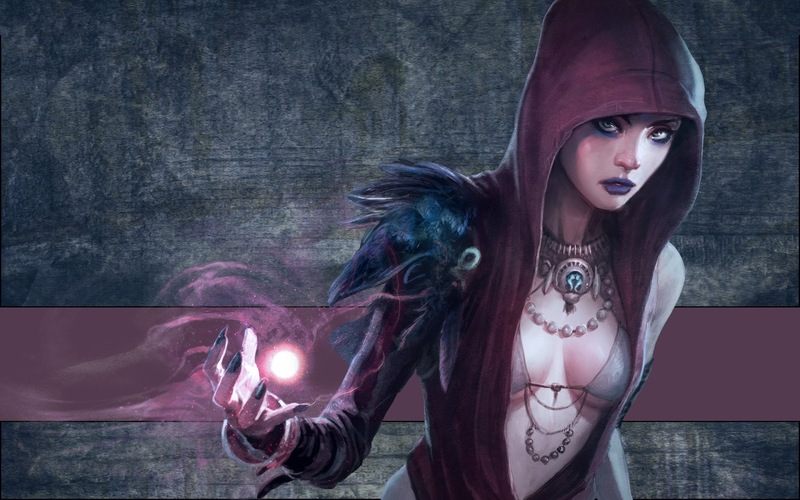 As it turned out, Morrigan led them well beyond the river, taking them through a path in the woods that Alistair swore was not on any map and brought them almost to the point where they had first seen the darkspawn. Considering that they could just about make out the highest towers of Ostagar from where they stood, this was not an unreasonable assumption. Alistair winced as the Witch stepped away and almost quick as a blink, transformed into a raven and flew away before anyone could offer a thanks or a farewell. Not that anyone but Neria would have, of course. It was already quite dark, and though Ostagar was within their line of sight, it was still quite a long way to walk, with the threat of wild animals and darkspawn ever-present, especially now that they would be going by the conventional route and not the secret paths shown by Morrigan. “As you say, fearless leader,” said Neria, and began to throw together some kindling for a fire. Alistair watched as she lazily put together just enough twigs as to form a little cone and snapped the flame to life. His own experience with mages was somewhat limited and overwhelmingly negative. He had gone on a few missions to hunt down Abominations – mages corrupted by demonic possession – and that was about it. 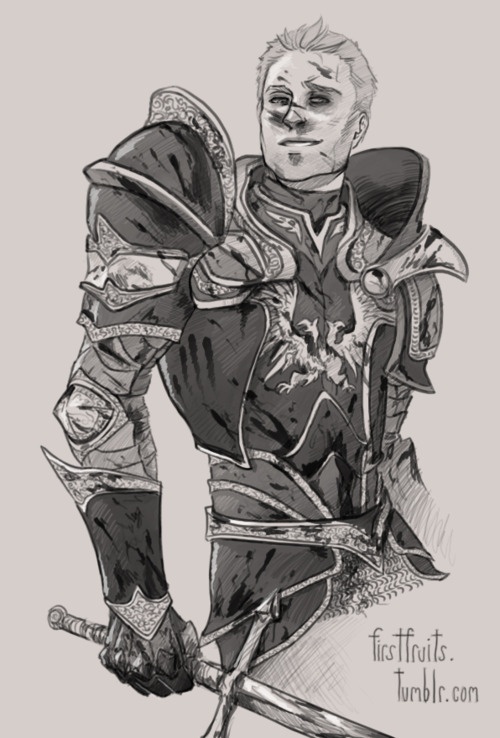 Duncan had emphasised often the need for an effective magical counter to fight the darkspawn, and he knew that the other Warden corps – the ones in Orlais and the Free Marches, for instance – definitely had a few mages at least in their ranks. But Ferelden had a small contingent of Grey Wardens in the first place, and Neria, if she joined, would be the first. “Who’s taking first watch?” asked Neria. Jory volunteered, so Alistair went over and pitched his tent. They would be in Ostagar tomorrow, and in a day or two after that, they would face another darkspawn assault. If they were able to rout the horde again, comprehensively, he guessed that the King would then return to Denerim and allow Loghain or the Teyrn of Highever, Bryce Cousland, to command the forces he left behind. The Wardens would split between a contingent remaining at Ostagar while a few would return to Denerim to take measures to strengthen the order, liaise with the Grey Wardens in other Kingdoms and prepare an effective strategy to find and tackle the Archdemon. The recruits, he knew, had not been told about the Archdemon. In fact, it was not something the Wardens often spoke about at all, outside of their own ranks. They would be told after the Joining, those that made it. He looked at the three – Jory hogging a leg of wolf, Daveth making some terrible jokes and Neria, looking at both of them with narrowed eyes – and wondered whether the two men would, or as far as Neria was concerned, should. She nodded obediently and went towards the tent that Daveth had put up. Alistair walked around for a little while, stepping into the darkness, listening for any sounds, hoping not to feel that inevitable sensation that accompanied the approach of darkspawn; a sort of calling sound in the head that was not really a sound. When he came back, the fire had burned very low indeed, and Jory sat by it. “Wake me up when you are ready to sleep,” said Alistair, moving towards his tent. “We should not have stopped here,” said Jory. “We should not have stopped,” he repeated. “The road is not safe by dark. We would have had a lot of difficulty were a wolf or bear to attack us after nightfall,” said Alistair. “This does not involve me,” he said, and entered his tent. But it did. He knew it did. When his turn to keep watch saw him hear the sound of wolves baying close by, and he called out to the others to wake up and come out, he could not help but notice that neither Daveth nor Jory looked as though they had been sleeping, and Neria’s wound was bleeding afresh. As they marched back to Ostagar in the morning, Alistair was feeling quite relieved. For one thing, he was looking forward to getting some decent cooked food – even the military cook seemed like a culinary genius compared to what he and the others had been making the past few days. He was also glad to get away from his companions. Such camaraderie as their last few battles had established had evaporated due to whatever had happened in the tent at night – what exactly, he did not care to know. They had dealt with the wolves that attached their camp easily enough, but since then, neither Jory nor Daveth could even bear to look at each other, while Neria only spoke in cruel laughs and cutting remarks. Ostagar’s tall wooden gate emerged before them, and the guard waved them in. Daveth and Jory went different ways – the Knight to the makeshift Chantry for some form of absolution for his sins with the elf, no doubt, and the cutpurse to the Quartermaster for a refill of ale. Alistair gave her a noncommittal nod and went on towards Duncan’s tent. Duncan was reading a letter when Alistair reached his bright campfire. He got up to welcome the younger Warden and they embraced. It was a cold winter morning, and Alistair hoped he could get some warm tea soon. But this was a priority. “We got the darkspawn blood all right,” said Alistair, handing over the small brown chest in which he had kept the stoppered vials. His mentor's eyebrows shot up in surprise. “Actually, they helped us. This Morrigan woman escorted us back to camp, cutting our travelling time to a day,” admitted Alistair, and in a few brief words recounted the particulars of their encounter. “I was thinking we should inform the Templars who are here already,” said Alistair. Alistair found a kettle placed on a wooden table outside the tent, and poured himself a mug. It was hot tea. Just what he needed. “And what do you think of our recruits?” asked Duncan. Alistair hesitated for a moment. “They know how to fight,” he said finally. Alistair poured out another mug of tea for himself before replying. “She's talented,” he said at last. “What?” his mentor’s eyebrows were raised. “Let her go, get her a pardon from the Revered Mother and let her return to the Circle,” said Alistair. “She’s a slave to the pleasures of the body, Duncan,” said Alistair. “You're saying the order of Grey Wardens, a thousand-year-old institution, would be destroyed because of one elf?” asked Duncan, that gravelly voice neither mocking nor quite sharing Alistair’s apprehensions. “I saw her seduce Ser Jory and play – play mind-games with him, vicious ones, belittling his performance, his manhood, his morals, all while doing what she could to ensure he would want to take her again. And then last night – I do not know what happened last night, but I think, that is, I suspect, that she seduced Daveth as well,” Alistair got the words out, somehow, while trying very hard not to picturise what he had just mentioned. Duncan nodded, and then walked away from him, towards the approaching King, just as Alistair passed out of sight behind the tent. He was making his way towards Wynne's tent when he saw Teyrn Loghain walking with his retinue towards the Quartermaster. He stopped, waiting for them to pass. Then the Teyrn's eyes fell on him. Alistair followed obediently. The Teyrn was more than a hero to him, like most who had grown up on the stories of Ferelden’s freedom struggle against Orlais, he idolized the man. The Teyrn seemed to be grinding his teeth as he spoke. Alistair paused. It was a tricky question. “I am sure that you and his majesty have planned an appropriate battle strategy in consultation with Duncan, sir,” he replied. They were now some feet ahead of the guards. The Teyrn addressed him in a low whisper. Leaving the astonished Alistair rooted to his place, the Teyrn strode away. He was still standing there when Neria came skipping up to him. “I'm better than ever,” she proclaimed with a girlish smile. She wore a white robe that was several sizes too large for her. Alistair guessed it belonged to Wynne. “Not that the offer is not…err…appreciated, but I think I would rather not. For the moment,” Alistair said, awkwardly. She scampered off in haste, leaving Alistair to walk bemusedly towards Wynne's tent. He rested through the afternoon, and when he returned to Duncan's camp as dusk fell, the three recruits were there with the Commander. Duncan heard out their accounts of the expedition patiently, not letting on that Alistair had already told him everything. Neria had changed into a brief blue and black dress that began well below her shoulders and ended just above her knees, but at least did an adequate job of covering everything in-between. Alistair had never considered himself a particularly perceptive person, but as they spoke, he caught the self-importance in Ser Jory's account, the exaggeration in Daveth's and the guilelessness in Neria's. While they tried to drum up what they had done, she spoke of it all with excitement, trying to explain the thought process behind their fighting tactics. To Alistair's surprise, she was full of praise for his own fighting skills. Finally, it was over, and Duncan asked them to take a good night's rest. They were just about to leave when a messenger peeked into the tent. “A message for me, boy?” asked Duncan, as the elf caught his breath. The elf nodded, and disappeared as someone called to him from an adjoining tent. Alistair turned. Duncan and the recruits arose. “What could this mean?” asked Alistair. “The King must want to congratulate us,” said Jory self-importantly. “Suddenly I feel very high-and-mighty,” laughed Neria. Duncan allowed the others to walk a few paces ahead. Alistair knew his commander well enough to know when he, too needed to hang back. “I hope he knows what he's letting himself in for, then,” said Alistair. “Does he know?” asked Alistair, sudden realisation dawning upon him. Alistair bit his lip. Somehow he was not sure which thought disturbed him more – that possibility that Neria could soon be the King’s lover or that she might not become a Warden after all. Nor did he understand why either should disturb him in the first place, but the mind is, he reminded himself, a strange thing.